Cos-play event at Scarborough Renaissance Festival this weekend. 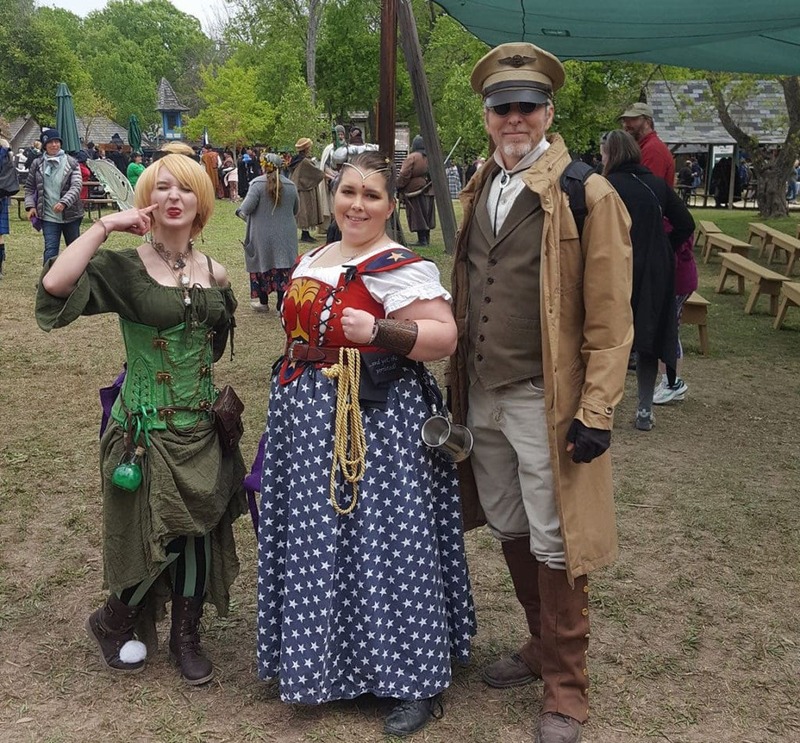 WAXAHACHIE—The world of fantasy comes alive at Scarborough Renaissance Festival® this weekend, May 5 & 6, 2018, as all fans of cos-play, Marvel, Anime, Steampunk, Sci-Fi and fantasy enthusiasts of all kinds are invited to join the Festival for a weekend made just for them! Fantasy costumes will of course be the attire of choice! There will be family friendly fantasy based costume contests for adults as well as separate costume contests for kids 12 and under. Contestants can get details and register for the contests at the Festival’s front gate by 12:00 noon each day. There will also be a Children’s Fairy Initiation Ceremony at 12:15 pm both Saturday and Sunday at the Festival’s Royal Marquee and visitors don’t want to miss the all new “Fae Follies” fairy show on the Whimsey Stage at 11:30 each day. This weekend will also be the Spring Celebration as the villagers of Scarborough celebrate May Day by adorning beautiful flowers and invite all Scarborough visitors to join in the fun. The winners of the Sunday Adult Costume Contest! Scarborough Renaissance Festival® is interactive fun for everyone, 16th Century Style! Visitors will enjoy full combat armored jousting, Birds of Prey exhibitions, the Mermaid Lagoon, a living chess match, Knighting ceremony, 150+ member performing company and 27 stages of non-stop entertainment. There are 200+ shoppes and artisan demonstrations along with Renaissance rides, games of skill and food & drink fit for a king. Limited engagement performers this weekend (May 5 & 6) include “The Danger Committee” and “The Toobadours”. Guest Artisans this weekend are KPE Pressed Flowers in Glass, Sculpted Jewelry by Connie Colten, and Masquerade Life Casting. New Festival Artisans for the 2018 season include Enchanted Chains, Hang De Sign, Living Art & Lanterns, Magpie’s Trick, Runaway Rabbit Press and Three Bells Tapestries. Also, May 5 and 6 daily Wine Tastings will feature the wines of Spain and the daily Beer Tastings will feature beers of Texas. The tastings sell out fast, so it is recommend that you purchase tasting tickets in advance. Make sure to check out the daily specials at the Rose & Crown Inn full service restaurant, Pasta Palace and Bakery as well as the largest food on-a-stick selection in Texas! Upcoming Themed Weekends and Special Events are the Celebrating Chivalry Weekend and the Mother’s Day Brunches May 12 & 13, the Legends of the Seas Weekend May 19 & 20 and The Last Huzzah May 26, 27 & 28 to finish out the 2018 season. Finally each weekend will have a variety of special entertainment and activities. 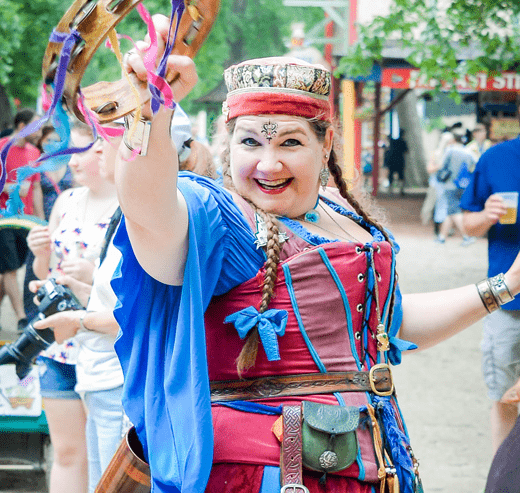 So Come Step Back in Time for the Time of your Life at Scarborough Renaissance Festival®! Open Saturdays, Sundays, and Memorial Day Monday, now through May 28, 2018 from 10 AM to 7 PM. Located in Waxahachie, Scarborough Renaissance Festival® is just 30 minutes south of the Dallas/Fort Worth Metroplex on FM 66 off of I-35E at exit 399B. From Austin or Waco, follow I-35E north to Exit 399. Admission is $28 for adults and $13 for children, ages 5-12. Children age 4 and under are free. Parking is free compliments of Waxahachie Nissan. Food, drinks, games and rides all require cash. Most of the artisan shoppes, the ticket booth and the Rose & Crown Inn Restaurant also accept credit cards. Tickets are available at the gate on Festival days and on-line at SRFestival.com. Discount tickets can be purchased at D/FW area Tom Thumb & Albertsons stores and discount coupons can be found at Waxahachie Nissan. Sponsored by Dr Pepper. For more information visit SRFestival.com. Facebook & Twitter (SRFestival) or on Instagram (theSRFestival).